For fifty years, Battersea Power Station has been a landmark known to Londoners, commuters and visitors from all over the world. As the time of its closure as a generating station grows nearer, there has been a campaign to save the station as part of London’s heritage. Yet in the early years, the row over building it was so fierce that it reached Parliament. It was planned in the mid-twenties as a super-station which would help meet the rapidly rising demand for electricity in London for many years ahead. The London Power Company’s idea was a bold one. In size alone, they envisaged a station which could generate 400,000 kilowatts (400MW) – equivalent to the combined output of their other nine existing stations. The station was to be built in two halves, with the first generating sets coming into operation in the early 1930s. What caused the uproar was the decision to build the station in the heart of London, where, the LPC said, it would be able to supply the growing demand more economically. From the time construction started in 1928 there were furious attacks, led by public figures such as the Archbishop of Canterbury. Every conceivable argument against it was used, but one of the main fears was that sulphur emissions would damage famous buildings, parks, works of art and even endanger health. But before generation had even commenced, the LPC had pioneered a gas-washing system which proved effective in removing more than 90 per cent of the sulphur from the chimney gases. When the first half of Battersea (the’ A’ station) started generating in 1933, the tributes were glowing. One newspaper called it ‘a flaming altar of modern power; another said ‘it bids fair to make St Paul’s Cathedral share her proud position as London’s architectural landmark’. The description ‘Temple of Power wasn’t inappropriate. The distinctive appearance was largely the work of Sir Giles Gilbert Scott, who also designed Liverpool Cathedral. The interior was equally impressive: the control room was panelled in Italian marble while even the huge turbine hall had terrazzo flooring. From the initial planning to final completion of the station, the plant at Battersea was kept to the forefront of current technology. The first two 69MW generating sets were large for their time, but before they had even come into operation the LPC had ordered a 105MW set – the largest anywhere in Europe. When that set came into operation in 1935, Battersea proudly achieved a world record thermal efficiency (the yardstick of effectiveness in generating electricity from a given amount of fuel. . . vitally important in saving production costs). By 1936 the LPC were planning to start construction of the ‘B’ station with a generating set of 100MW ‘needed by the autumn of 1940′. Once again the boiler plant design was being carried to new limits, creating fresh technical problems which were further complicated by the onset of war and the shortages of labour and materials. Even so, the new 100MW set was brought into service only 12 months behind the 1940 target date; a remarkable achievement in those conditions, only made possible by connecting the set temporari1y to the’ A’ station’s boilers. In the war-time London blitz, Battersea power station was luckier than some of its neighbours; but it didn’t escape damage, and at times operations were only kept going by ingenuity and determination. Battersea was something of a symbol of the spirit of Londoners themselves in those dark days. The years following the end of the war were particularly difficult for Battersea. Like other stations, there was a huge backlog of repair and maintenance because of the way the plant had been kept running throughout the war. Work had started on a second ‘B’ station set of 60MW, but in London as elsewhere the demand for electricity was greater than generating capacity, and power cuts became the order of the day. Yet despite these problems, the LPC took the opportunity of post-war reconstruction to introduce yet another innovation – a District Heating Scheme which provided a population of about 11,000 people in Pimlico with heating and domestic hot water – the first scheme of its kind in the country. 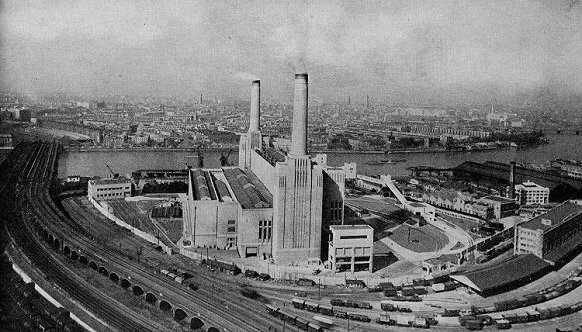 The London Power Company never saw completion of their Battersea station. The electricity supply industry was nationalised in 1948, and It was five years later that the final 100MW set was brought into service, making Battersea the third largest station in the country. Instead of the original 400MW target, it had a generating capacity of 509MW – burning some 10,000 tons of coal a week and able to contribute almost a fifth of London’s total electricity supplies from 29 stations. Yet almost incredibly, this had been achieved within a design concept nearly thirty years old; and for twelve out of sixteen years it had headed the list of British stations with the highest thermal efficiency. Even when new stations came into service with more modern plant, Battersea remained a showpiece. From its use in the media, particularly television, it has been something of a symbol of the whole electricity supply industry in this country. When in 1980 reporters started predicting its final closure, a new phenomenon occurred: the start of a campaign to save Battersea Power Station as part of London’s heritage. As one newspaper put it, this was an ugly duckling that had turned into a swan. In 1980 Michael Heseltine, as Secretary of State for the Environment, ensured adequate time for considering its future by listing it as ‘a building of special architectural or historical interest: and as the actual closure date grew nearer, the CEGB gave a lot of thought to the future of the site. The search for a viable alternative use which might enable the building to be preserved is now starting in earnest; and there’s no doubt that this will be accompanied by a wide-ranging debate. A fuller account of the station’s half-century of achievements and successes, often against heavy odds and difficulties, is given in an illustrated booklet ‘LANDMARK OF LONDON – the story of Battersea Power Station’. For the rest, whatever may happen regarding its future, Battersea has already gained a unique place in the electricity industry’s history as well as in the memories of all who served there – and others, too. For as the Editor of The Times Diary wrote: ‘One thing is certain. Londoners love Battersea Power Station’. Coal is delivered to the power station by sea, rail or road. From the coal storage area (1) it is fed by conveyors to the boilers (2). The heat from burning coal boils water circulating at high pressure in the boiler tubes (3) to create high pressure steam (4), The steam is taken by pipes to the turbine (5) where it is used to drive the shaft (6) at high speed. From the turbine, the steam enters the condenser (7) and passes over tubes containing cooling water. It is thus condensed back into water and creates a vacuum which helps improve the flow of steam through the turbine, The water is returned to the boiler under pressure by a series of pumps. The generator consists of a rotor (8) and a stator (9). The rotor (an electro-magnet made of a number of windings mounted on a shaft) is coupled to the turbine shaft so that it is turned at high speed and generates electricity in more windings that make up the stator. A small generator (10) driven from the end of the rotor shaft, produces the current required to energise the rotor. In the largest modern generators electricity may be generated at about 25,000 volts but for efficient transmission over long distances the voltage is increased by transformers (11) to 275,000 or 400,000 volts. The voltage is reduced by other transformers (12) to 132,000 volts for local transmission and reduced still further for distribution to consumers at suitable voltages 33,000 volts for heavy industries, 11,000 volts for light industries and 240 volts for homes and farms. Update: Since the closure of the power station in 1983, ownership of the building and surrounding land has changed hands several times, with each new owner promising development that will retain and repair the iconic Grade II* listed building. The site now redeveloped as residential property.